If you ever plan to go to Vietnam, make sure you spare some time to visit Hanoi. 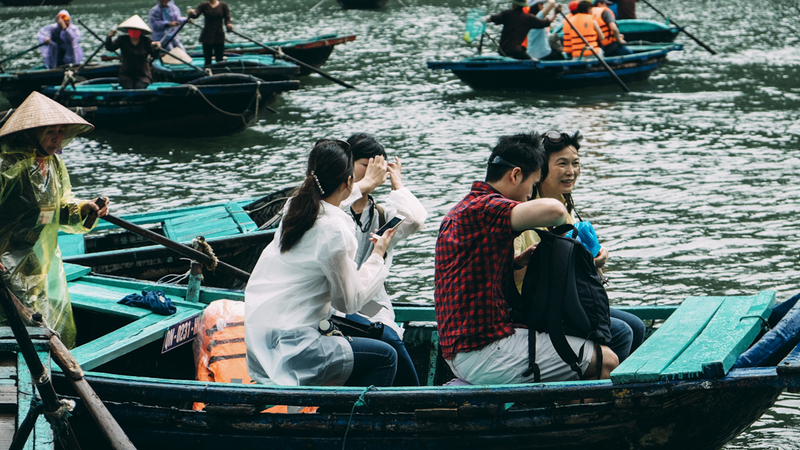 As we did cover in our previous travel journal from Hanoi. 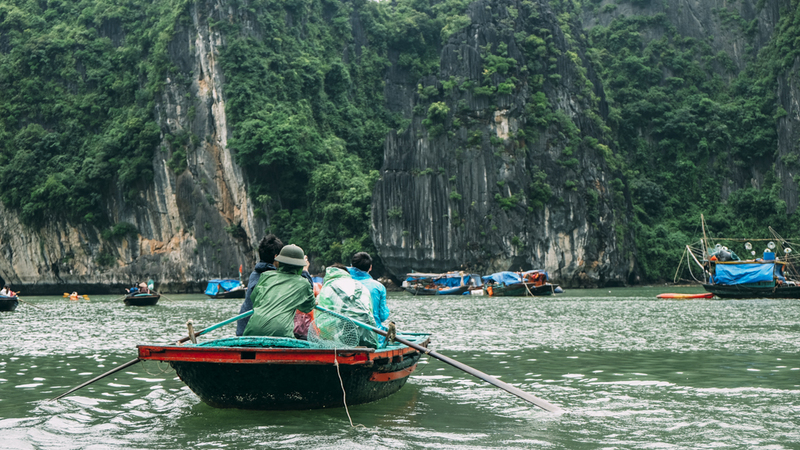 If you do, then your next move should be planning to see Ha Long Bay with your naked eyes. It’s the North Vietnam’s treasure, hands down. I don’t know if you guys share the same thing with me, but if I know one thing about Vietnam besides its pho, it would be Ha Long Bay. I’ve seen it many times on the internet, on social media. That misty water with some scattered islands, cruise boats, local fishermen with their cone-shaped hats, I mean you must’ve seen it at some point somewhere. As far as I thought, that must be just the way tour companies or people trying to sell Ha Long Bay, the way they advertise it. Until I see and experience it myself. Our trip to Ha Long Bay took around 3 hours ride. 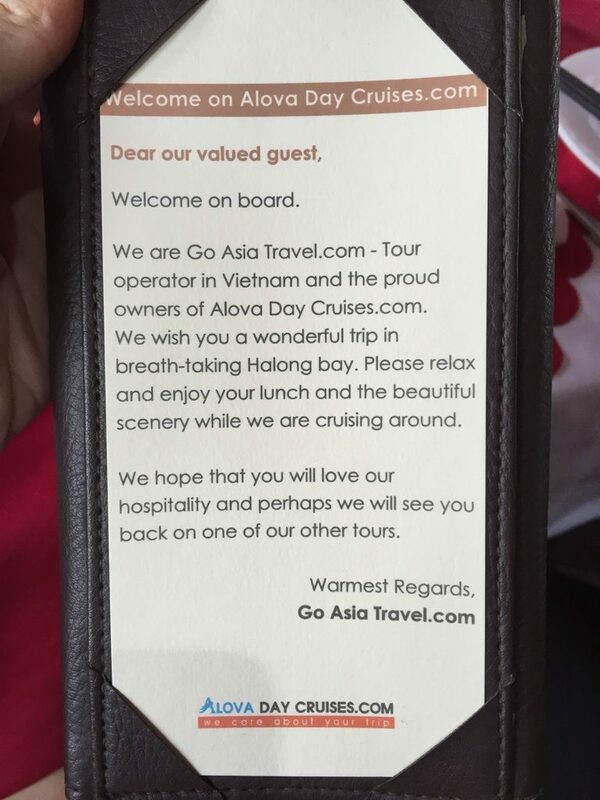 We had our USD 52 Ha Long Bay tour pre-booked from Alova, a cruise company that sells tours in Ha Long Bay. That morning, our guide, Mr. Tom (Hoang Van Lam) picked us up at 8. He used a minivan carried a total of 10 other people as a group. We had Japanese, Germans, India, Australians, Americans, and some other nations that I cannot remember. Once we arrived, we walked into this port and then wait for Mr. Tom to take care of some ticket stuff, I guess. The port seems relatively busy and crowded, especially with foreign tourists. It seems like this Ha Long cruise thing has become the major business here. A lot of tour groups waiting for their guide. The weather is somewhat bad, it’s dark, rainy, and very windy. By the time we walked to our cruise, which is a medium size boat enough to fit 50 people, it’s raining pretty hard. Everybody walks faster but be careful with the slippery deck. Our tour package is a one day cruise with lunch on boat and cave visit. So this is what it looks like inside the cruise. Inside the cruise equipped with more 6 dining tables, each can fit up to 6 persons. The interior of the boat is pretty well decorated. It has wooden finish at the main dining area complete with a bar to serve you drinks. This room got CCTV and some fans attached as well. They have their kitchen behind the bar, at the back side of the boat. They got toilet on the boat, some boat has separated toilet for both men and women. As soon as everybody inside, there we start our Ha Long Bay Cruise. Mr. Tom did some introductory about this boat, how long we’re gonna spend, what to do if there is an emergency, bla3. 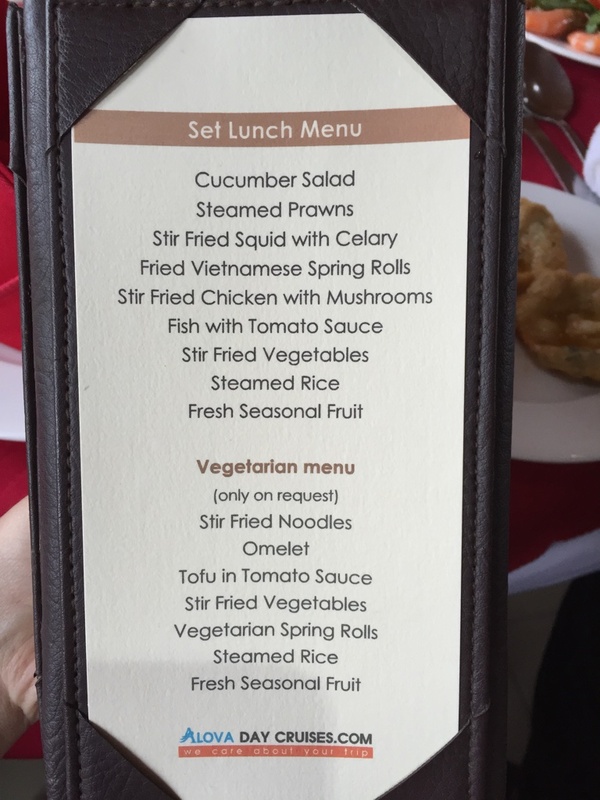 The lunch comes with a free drink of plain water. However, you can buy drinks on board. They sell soda, beer, tea, coffee, and even wine. Prices as shown above. We had a soda for ourselves. 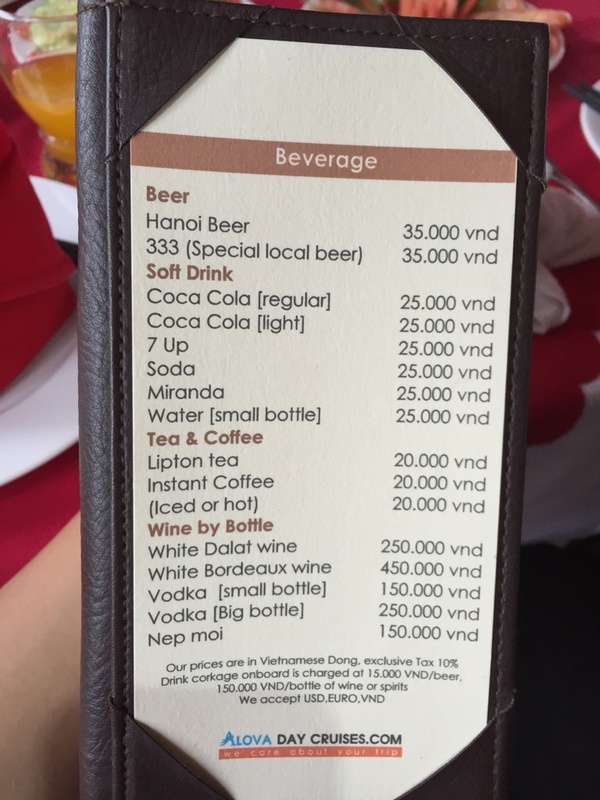 At first, I thought we’re free to choose drinks. But in the end, we had to pay an extra for that. They will also try to sell you some souvenir while cruising, such as t-shirt and accessories. Nobody buys anything that time because it’s kinda pricey. We had lunch shared on one table together with the couple from Germany and the old man from Japan. How’s the food? Hmm… From 1 to 10, I say 6. About half an hour, the rain stopped and Mr. Tom said we can go outside and enjoy the view. Although it’s still dark and rain a little bit, but the view is majestic. The first thing to welcome us is these two big rock islands. There are other boats too, we’re all seems to go to the same direction. In minutes, the weather changes a little bit more towards warmer temperature with the sun coming out from clouds. At least we got a better lighting now. We go to the second level of the cruise to get a better view. What’s cool, though, they have a karaoke room upstairs. I think it can fit up to 20 people inside. Maybe that’s a VIP service. Sure you can also do karaoke there, but what’s the point of staying inside if you can see this beautiful view all around outside. And from this point, we enjoy a little heaven in Vietnam. 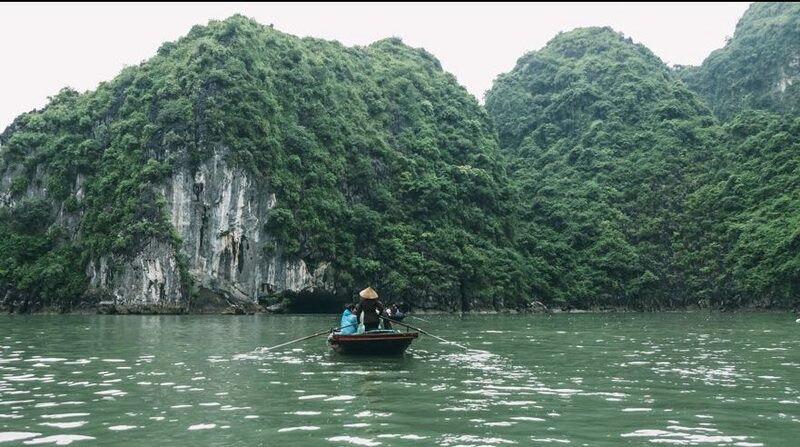 Ha Long Bay is famous for its scenic ocean karst topography, located in the area of Gulf of Tangkia, North Vietnam. The area is 1,500 square kilometers with a coastline 120 km from Hanoi. This area consists of mostly limestone, about 2,000 islets in a different shape. The core zone area of the bay (334 km2) has a density of 775 islets. These islets we’re talking about are the one that makes Ha Long Bay so famous and attracts tourists from all over the world. They are products of 20 million years under the wet tropical climate. Ha Long Bay is a center of a larger zone which includes Bái Tử Long Bay to the northeast, and Cát Bà Island to the southwest. Sometimes tour companies offer a continuous trip to those areas as well. They share pretty much the same view to Ha Long Bay. 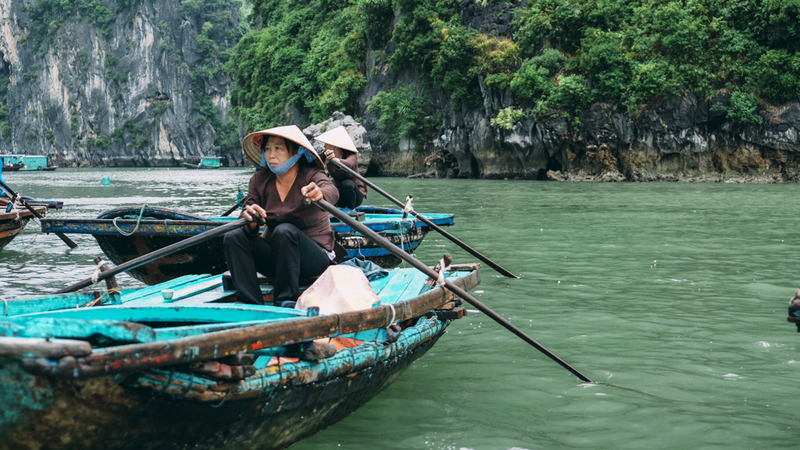 The name Ha Long Bay itself means “Bay of Descending Dragons”. Cool name, right? So Asian… Dragon…  This has something to do with the French. 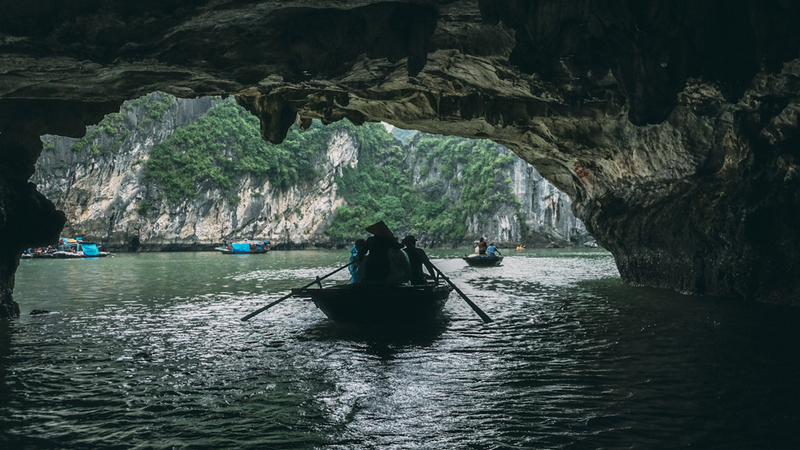 In the late 19th century, the name of Ha Long Bay appeared on a French Marine Map. The Hai Phong News, a French newspaper of the time published an article “Dragon appears on Ha Long Bay”. Their report in 1898 a sub-lieutenant named Lagredin, captaining the Avalanse reported seeing a huge sea snake on Ha Long Bay. This was also witnessed by many of the crews. This became the European image of the Asian dragon. There are some big islands that actually have people living permanently in it. Gad bah island and Tuan Chau island are the two largest in the bay area. 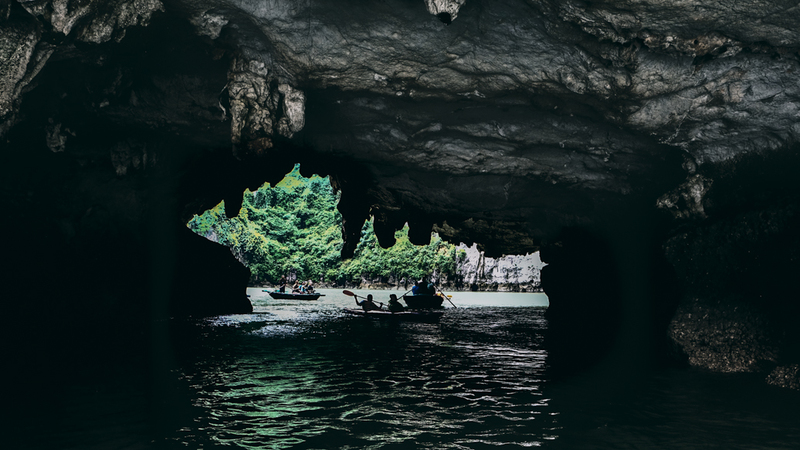 Some islands also have cave located inside, which will be our next stop after we ride a smaller boat. 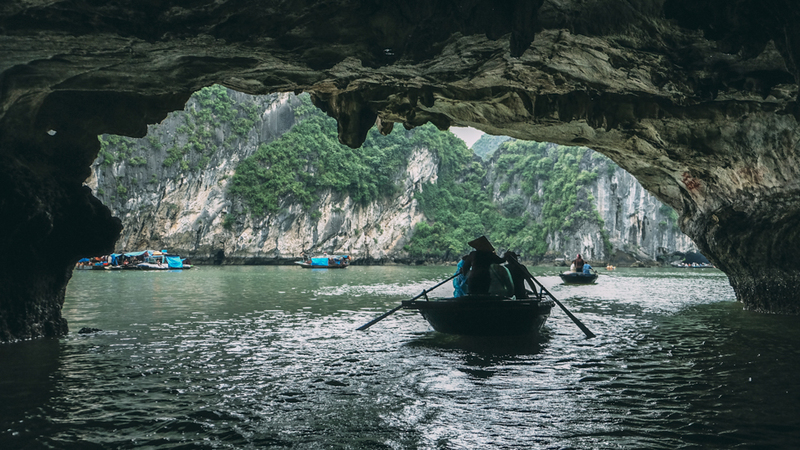 Ha Long bay has officially become UNESCO World Heritage Site since 1994. It’s now officially protected from development, such a relief. However, there are still some hotels and beaches serving tourists in one of these islands. 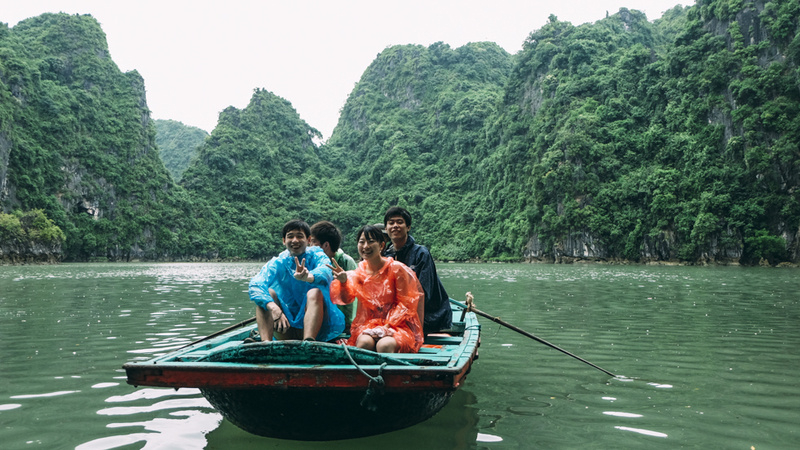 Of course, there are some tips here and there on the internet for you to get the most of Ha Long Bay Cruise. One general rule when you travel here, you need more time. That’s it. We actually consider to stayed overnight on the cruise when we plan the whole thing at the beginning. But because of a thing or two, we skipped that option and go with one day cruise. 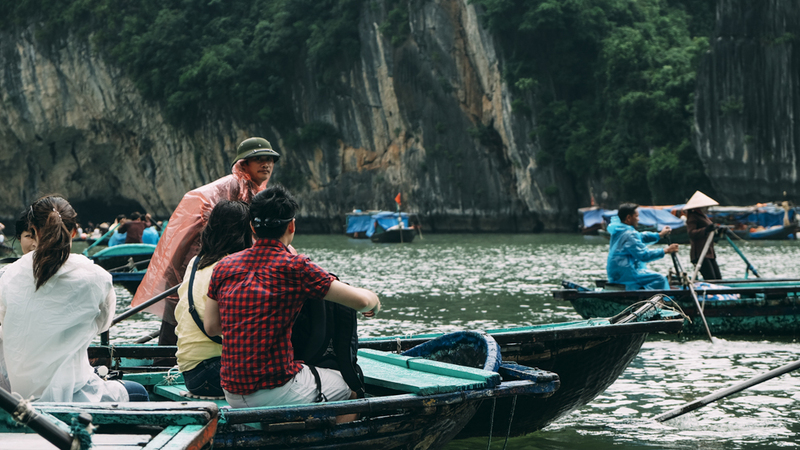 If… You seriously want to have the best of Ha Long Bay, then book an overnight stay on the cruise. 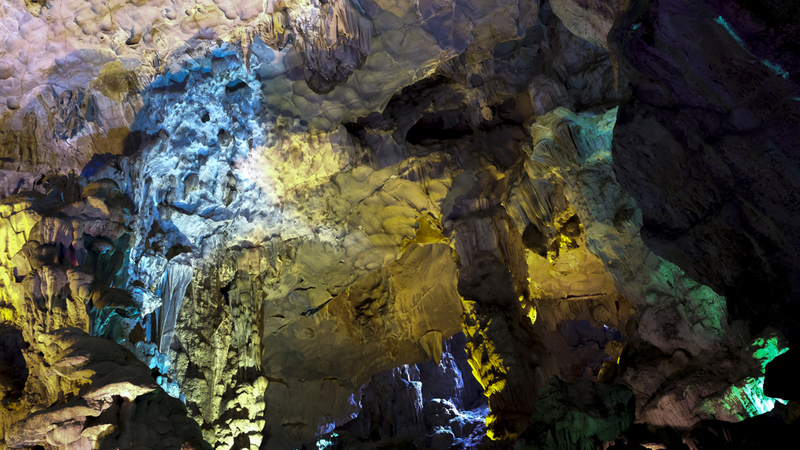 Minimum of 2 days to get the most of Ha Long Bay. When you stay overnight, you can enjoy the sunset, the moonlit night, and the sunrise. You can get it start from $150 something. The luxury one can go up to $300. Worth it? That’s something I’m gonna find out when I re-visit this place. 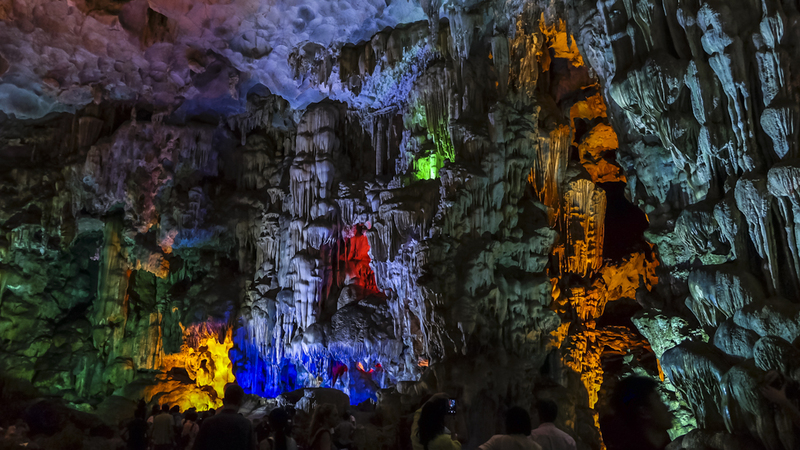 The best time to visit Ha Long Bay is from March to June. Avoid crowded public holidays (30 April 30 and 1 May). June to September is low season so you can get better deals but pay attention to storm forecasts. October and November is high season again and it is still sunny. December is cool, cloudy but dry while January and February are cold and foggy. 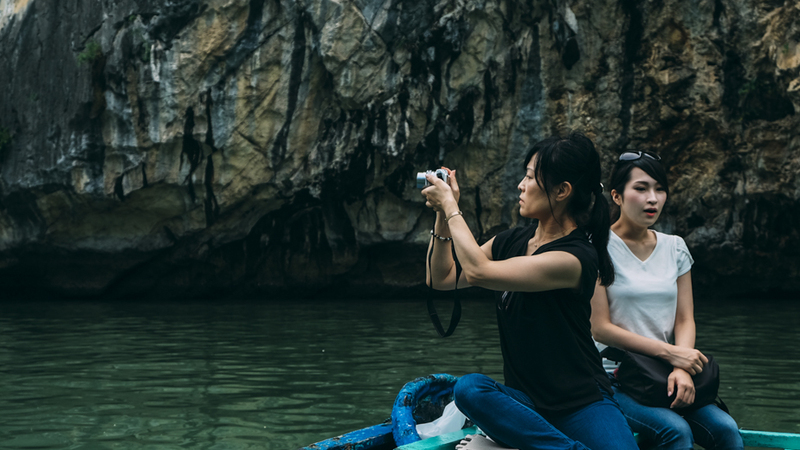 You can always book Ha Long Bay tour from any travel agent or from your hotel in Hanoi easily, just be sure to check the package carefully. One wise advice, though, if it is good enough, it probably is. Pay attention to every details, what is included, what is excluded. We made a stop at some kind of a floating village. Seems like they called it a floating fishing village. 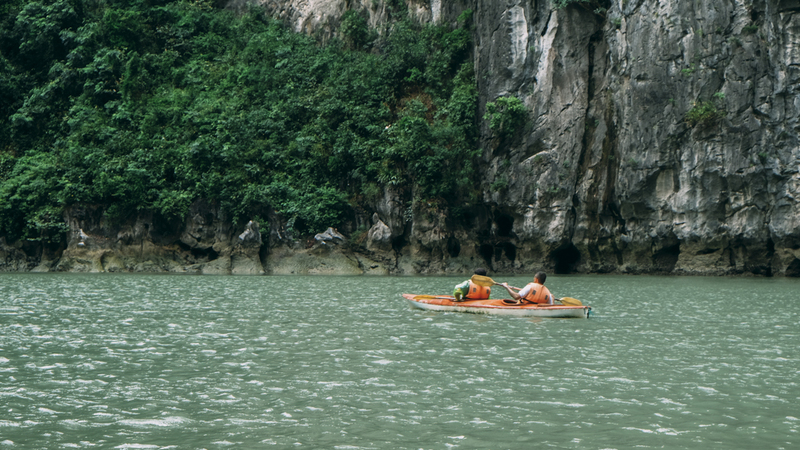 There are many cruises parked here and have their guests go out to enjoy kayak or small wooden boat to explore some remote area of the Ha Long Bay. I guess it’s in the package already for us to explore a smaller remote area of the bay. By the time we arrived at this place, a lot of these small boats already waiting for guests from some cruise. Every guide arranged which boat to have for their guests. One boat can serve up to 6 persons. At first, we chose to stay in the cruise because it’s raining again and it’s pretty hard. I didn’t bring any jacket or raincoat (attention if you travel in September), and my camera is not weatherproof. So I think I’ll stay. But thanks to God, the weather suddenly change. It’s sunny again, so within that 10 minutes window time for Mr. Tom to arrange his guests, now we’re going down catching up with the other to ride a boat. It’s still windy, though. Kinda cold, but still good. You’d better bring a jacket just for precaution. And with this, so our exploration began.  I’m not really sure how to put this into words, I’m more of a visual person anyway. But I can say this is the best experience I had when traveling in Vietnam. Hands down, guys. Here are some photos to show you what we saw when on the small boat paddling around the remote area of the bay. It took us about 30 minutes to go back and forth the docking area. It’s worth every penny. Passed this cave under one islet, then it’s another heavenly peaceful green look all around. Wanderlust Ha Long Bay, right? 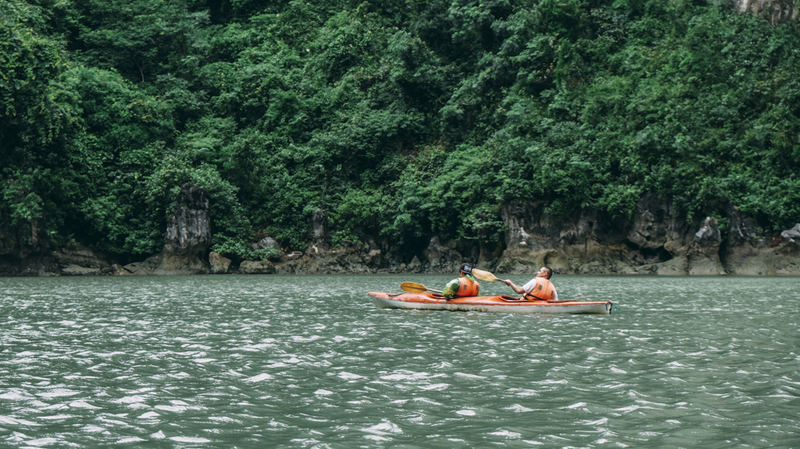 You can hear the peaceful sound of birds chirping, the wind blows, the paddles meet the water, and sometimes tourists chatting each other while they taking pictures of this beautiful place. We went on one boat with an Indian guy traveling alone. He’s not much of a talkative person, though. 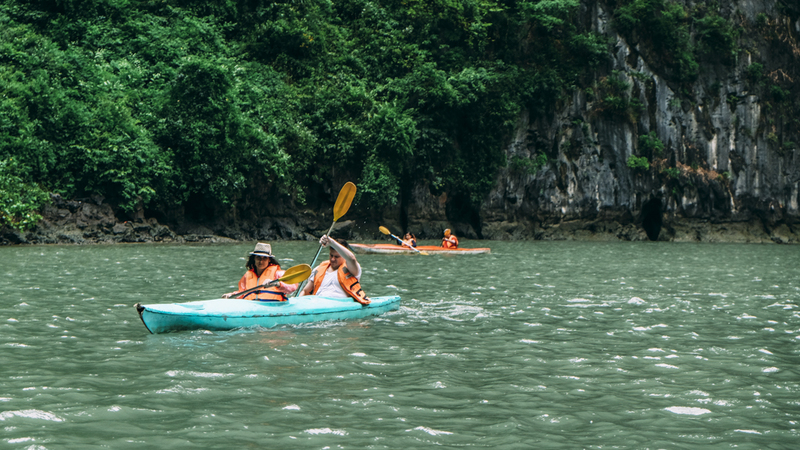 You can also rent a kayak to go kayaking yourself. Of course, it comes with additional cost. I’ve read it could cost you around $25. If you’re into it, you should check it out. After a while, it’s time for us to go back to the floating dock. There are more tourists coming, they expect us to leave soon because other cruises are about to dock. Since it’s not so big, they have to take a turn to dock at this floating dock. You can also swim in this area if you like to or why not go scuba-diving? Seeing this dreamy lagoon makes you want to feel the water soaking wet your skin. I’m not into diving nor have time for that. But I saw some tourist in their bikini ready to jump. Since we don’t have much time to see everything here, Mr. Tom rushed everybody back to the cruise. 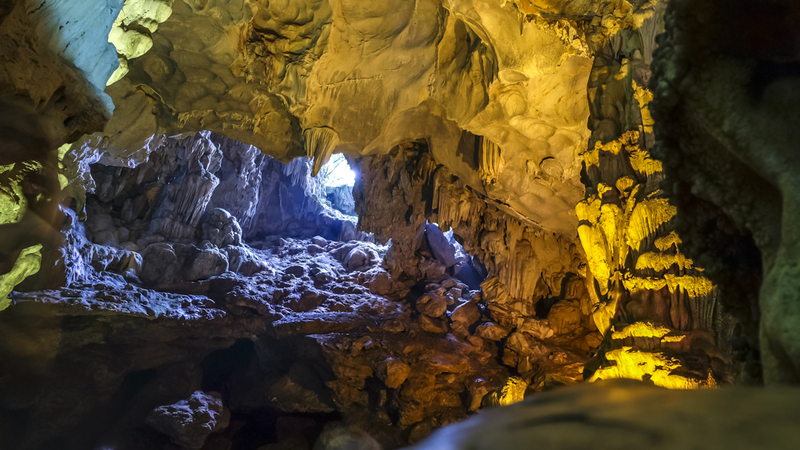 We’re heading to the next stop, the biggest cave and the most visited one in the bay area. Tien Chung Grotto. It took us almost another 30 minutes to get there. So everybody was chillin’ with the beautiful Ha Long Bay view along the way. The wind was quite strong that time, but thanks to the sun, it makes the journey going bright. Even some islands look beautiful because of the sunlight cast through the green trees on top of those islands. Such as this one. Looks like everybody is having a good time, each with their own chillin’ spot. Some on the upper level, some on the lower level, some inside playing with their phone while waiting. This one old man from Japan is really the one that catches our attention. 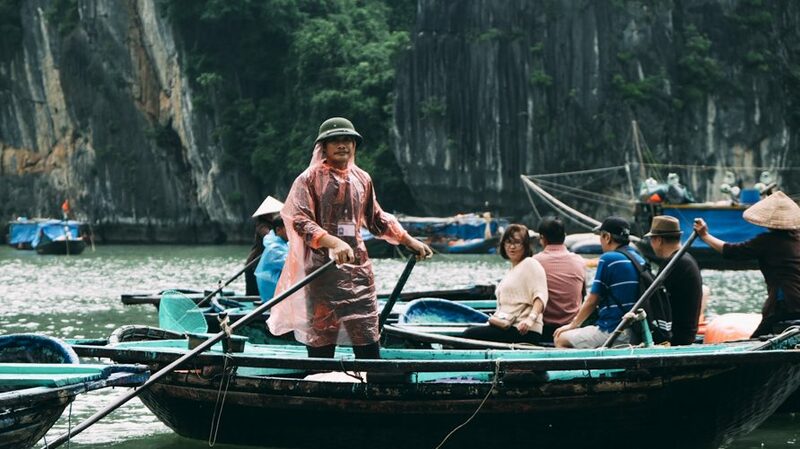 He’s all by himself, nothing bothers him, just him and Ha Long Bay. Just by looking at him chill me down, you know what I’m sayin’? This is where we dock before we enter the biggest cave in Ha Long area. 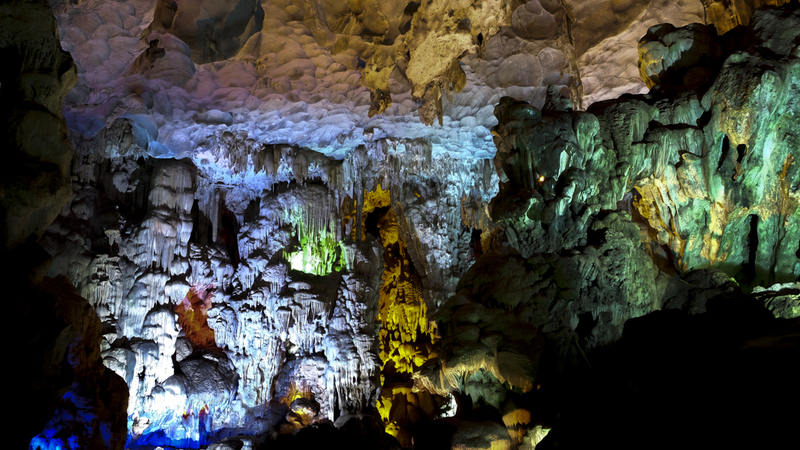 Hang Đầu Gỗ (Wooden stakes cave) named the Grotte des Merveilles by French in the 19th century. 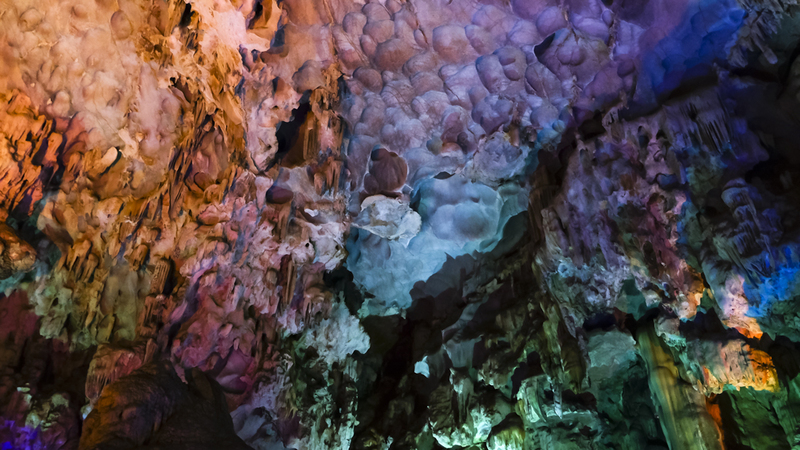 It consists of three large chambers contain large numerous stalactites and stalagmites. 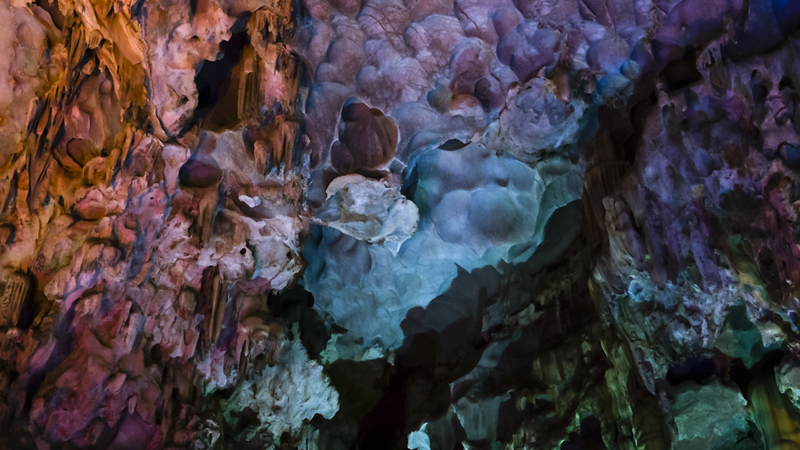 Mr. Tom did mention that we will see such a beautiful cave, the largest one. The thing with the word “beautiful” is that it really a subjective word. I seriously don’t think the cave is that beautiful. It’s a bit fake, in my opinion. They put lighting inside in various colors. I don’t know, for me, it’s not supposed to be over like that. They did it no purpose to make the structures inside look even more dramatic. Here are some photos inside, take a look. See the colors? What do you think? 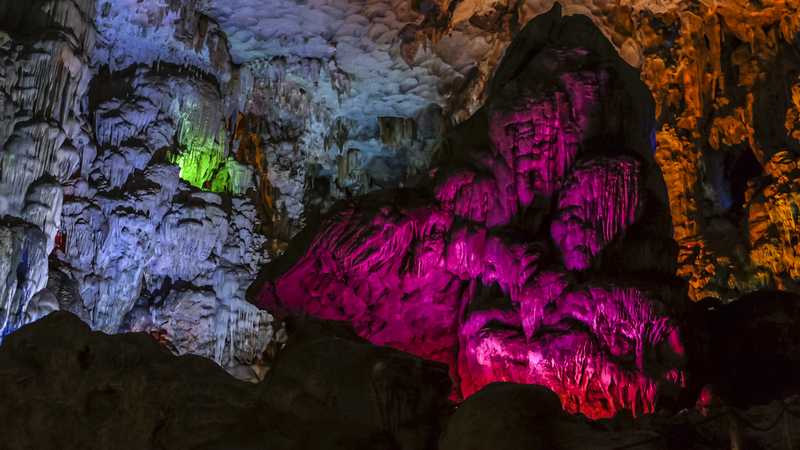 This looks like Disneyland in a cave. I think it will be better without colorful lighting. You must be careful with your steps, it can be very slippery inside. Mr. Tom took us around explaining this cave, sometimes pointing the rocks here and there while asking what it looks like. I’m not even close to see if there are any stones that look like this, like that. I’m too distracted with the colors. Long story short, we spent about 30 minutes inside the cave. And finally, after this, we’re going back to the port for another long long ride back to Hanoi. We made another stop at a shop for a toilet break. But this place is super super packed with tourists who seems like just like us, going back from Ha Long Bay. That will be the end of this Ha Long Bay journal. In all seriousness, we really enjoy this Ha Long Bay trip. It’s definitely one of the best experience we had when traveling in Vietnam. Do we plan to come back in near future? Yes, definitely. Only the next time will be an overnight cruise. Gotta see that sunrise and sunset moment. That’s it, folks! I hope you enjoy reading through this long post. 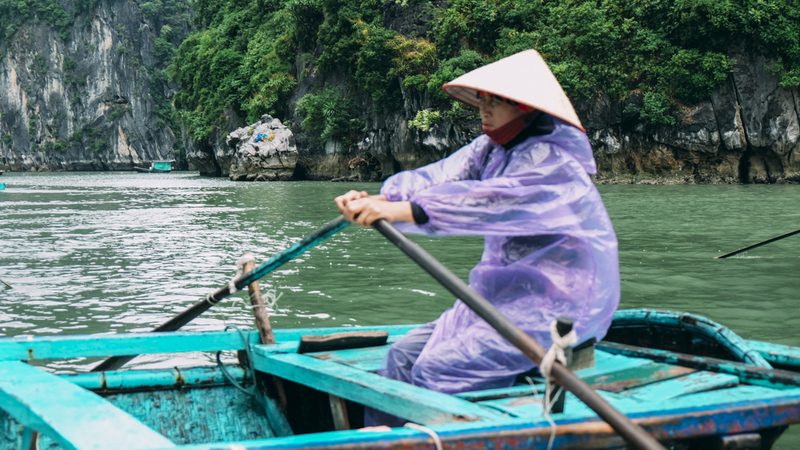 If you need help with information or anything about Ha Long Bay or Vietnam, leave a comment below. We will try to help as much as we can. 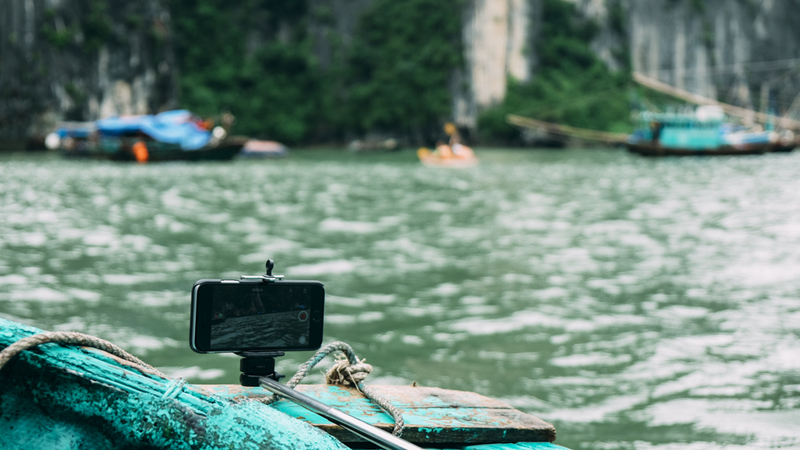 Be sure to share your travel experience to Ha Long Bay in the comments, too. 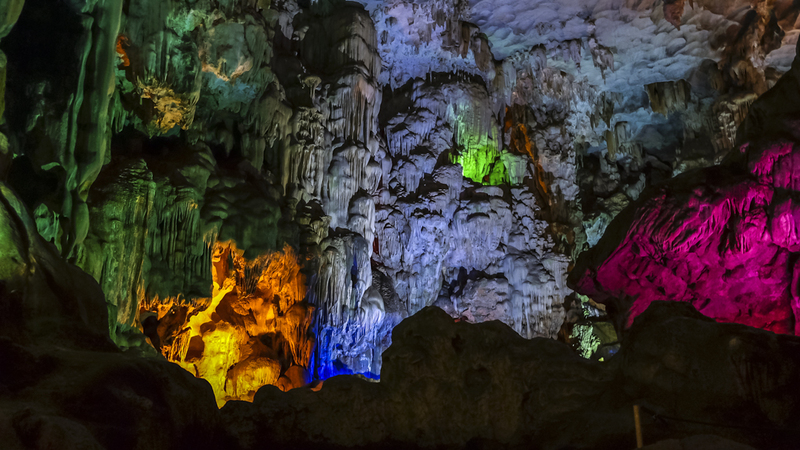 Check out our travel journal from Ho Chi Minh City, Chu Chi Tunnel Experience and Hanoi city as well. Don’t forget to subscribe to our newsletter! Until next post, bye!